At the end of a mile-long drive through forest and field, Whiskey Creek Golf Club has a feeling of privacy and seclusion. Bordered by a high ridge of hardwoods and a winding, free-flowing creek, the property contains many different environments and natural features including springs, streams, stone walls, wetlands, rock outcroppings, broad meadows, pine forests and dramatic views of the Catoctin Mountains. Architect J.Michael Poellot and design consultant Ernie Els, a 2-time United States Open Champion, have designed Whiskey Creek to take full advantage of it's spectacular setting. "The property is amazing," Poellot says. "It's only 35 miles from Washington, DC, but it feels like a different world." Poellot and Els wanted their golf course to be as big and bold as the land itself, and they approached the design of Whiskey Creek as an opportunity to create a world-class golf course. Els has won tournaments all over the globe, and Poellot's firm, JMP Golf Design Group, has a resume peppered with some of the most highly ranked courses on the Pacific Rim. Whiskey Creek was their first collaboration, and Els said, "We wanted to make it a winner." For sheer excitement, Whiskey Creek is hard to match. 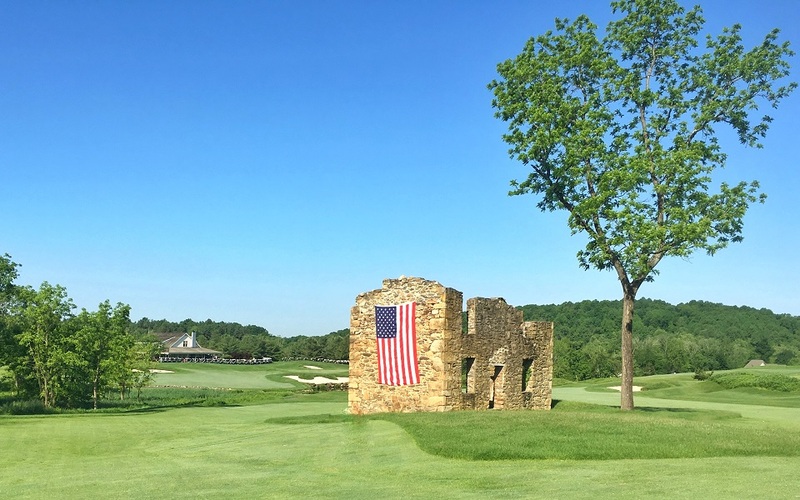 The course has several elevated tees, including the dramatic fifth tee, where the tee box is framed by huge boulders and the fairway tumbles down to a green 100 feet below. The view seems to stretch across all of Maryland. The 14th tee isn't quite as high, but the drive is even more challenging, as the tee is perched above a long, narrow lake. Even the par 3's are formidable, protected by wetlands, water, bunkers, or rock walls - and in the case of the 200-yard 11th hole, by all of the above. Yet the drama is only one element of the course, where Poellot and Els have crafted holes that embody their philosophy of strategic design. 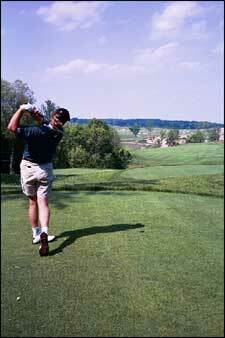 On just about every hole, the golfer has to make a decision that balances risk and reward. 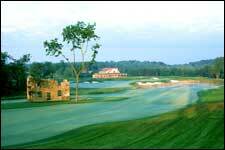 Whiskey Creek has a pair of par 4's that can be reached with a long drive. However, the golfer who tries to drive the green had better be prepared to pay the price if he misses. The par 5 18th, with the fairway forking around the stone ruins of an old farmhouse, is the ultimate strategic hole. Drive left, and the green is reachable in two shots. Drive right, and the hole is at least a full shot longer. Both the bold and cautious golfer will find a route at Whiskey Creek - and both will have to call on their judgement and imagination throughout the round. One of Ernie's major contributions was to bring the eye and experience of a world-class tournament golfer to the design of Whiskey Creek. Like most of the tested-and-true championship layouts, Whiskey Creek is an honest golf course, with its challenges and hazards in plain sight. And in keeping with Els' preference for classic courses, the holes at Whiskey Creek have been designed to challenge a player's shot making ability. "Whiskey Creek is a course where you have the opportunity to play a full range of golf shots and really think about your strategy for playing each hole," Els said. "It's a course that offers that traditional feel to the public golfer, not just a course where you bang the ball around. At the same time, Els and Poellot were determined to make the golf course as playable as possible. Higher handicappers will like the generous fairways, the multiple sets of tees, the open approaches provided to most greens and the gentle contours of the greens themselves. "Whiskey Creek offers a wonderful opportunity for a highly memorable round of golf due to the great diversity of the natural setting of the site's surroundings," said Poellot. "The golf course is a very true test of golf that Ernie and I know golfers of all abilities will enjoy playing time and time again."